%Portfast has been configured on FastEthernet0/7 but will only have effect when the interface is in a nontrunking mode. You can verify BPDU guard with the show spanning-tree summary command. You can verify BPDU filtering by using the show spanning-tree detail command. At the end of th will see the number of BPDUs sent and received. The number received should always be t, and the should be small and not increment if BPDU filtering is enabled. 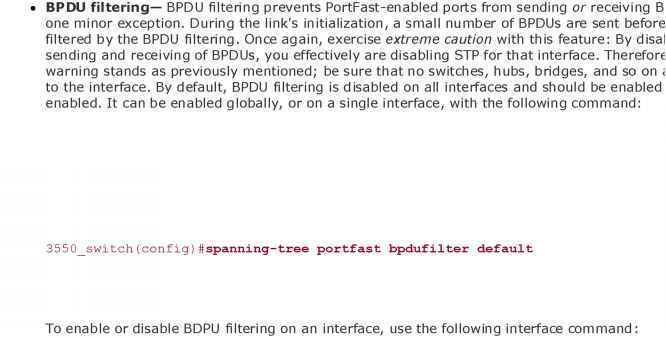 Example 1-36 lists the output of the spanning-tree detail command after enabling PortFast with BPDU guard and BPDU filtering on in FastEfOsrnet t/ p.